MÉRIDA, YUCATÁN – Have you ever wondered about the many, many cantinas in Mérida, and whether it would be interesting (or safe) to go into one? Following exhaustive research (it’s a tough job, but someone has to do it!) I’m pleased to present the following non-scientific evaluation of Mérida’s cantina scene; the different types, the experience, etc. First things first – what exactly is a cantina? Basically it is a bar, often with fairly basic levels of comfort and service, frequented mainly by ‘working class’ men. The greatest concentration of cantinas is to be found in centro; however the various colonias, especially in older parts of town also generally feature at least one and often more. In the USA and other countries, “Mexican” restaurants often incorporate ‘cantina’ into their name (think “Coyote Cantina” etc.) and feature garishly colored decorations, and menus majoring on items such as chimichangas. 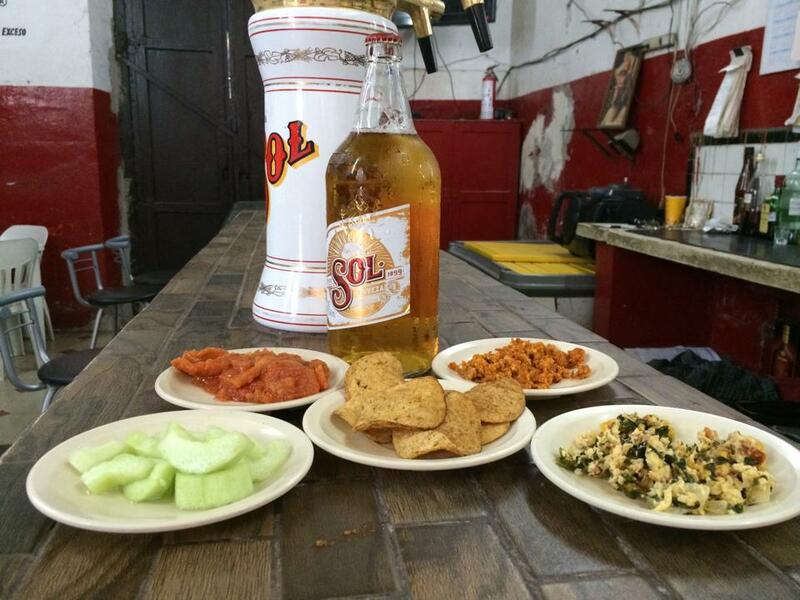 If this is what you are looking for, you will NOT find it in a ‘cantina’ in Mérida! Sometimes, rather more upscale bars call themselves ‘cantinas’; for example “Doña Josefa Cantina” on Calle 60 in centro, or “La Cantina de la Mexico” in Colonia Mexico. They are most definitely NOT cantinas in the traditional sense of the word. Neither are “Eladio’s”, “El Lucero de Alba”, and “Los Henequenes”. They’re all fun places and worth visiting, but cantinas they are not. To add to the confusion, most ‘real’ cantinas don’t feature the word ‘cantina’ in their name. 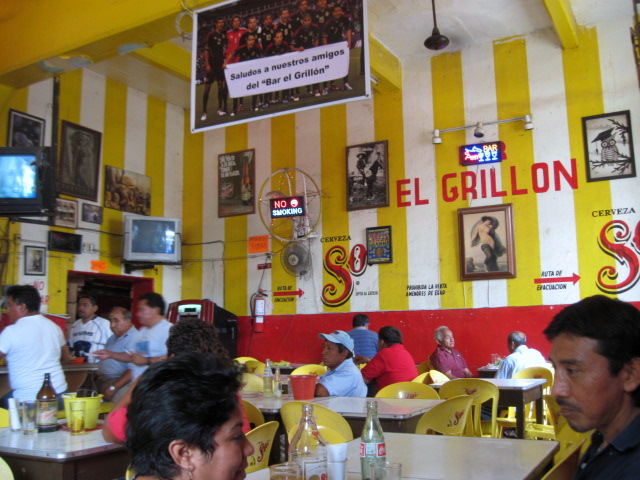 They may call themselves ‘Bar’, ‘Restaurant-Bar’, ‘Sports Bar’, or just a name such as “El Grillon”. How then can you recognize a ‘real’ cantina? Generally speaking they have somewhat low key entrances, often with swing doors; normally the interiors cannot be seen from outside, and they are frequently windowless (due to licensing regulations governing ‘cantinas’ which are different to those governing ‘bars’.) More often than not, they are loud, with juke box music (or live bands) playing, clearly audible from outside. Back in history, cantinas in Mexico were famous for their signs prohibiting the entry of women, children and men in uniforms (i.e. soldiers, police, etc.) Due to equality laws, the prohibition of women has of course been removed, however in many cantinas, it is still unusual to see female customers, and, in those establishments, women are likely to feel uncomfortable if they enter. Others however feature a loyal female customer base, and ladies wishing to visit a cantina can certainly find an establishment where they will be welcomed and comfortable. There’s a huge amount of history in some of the cantinas in the city; most have been operating for decades, and some have been serving customers continually for more than a century, often being handed down from father to son. The older ones sometimes proudly display a plaque, photos, or other information about the founding date. 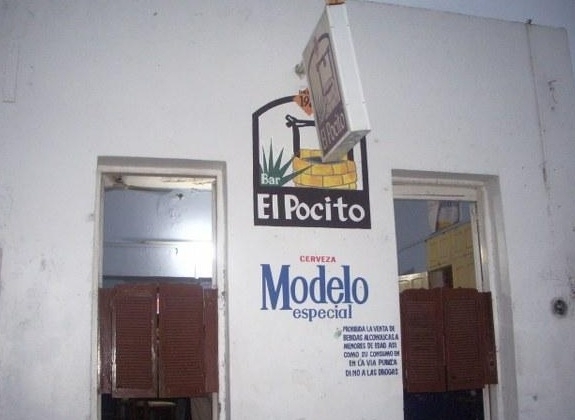 Cantinas in Mérida tend to serve beer from one of the two major Mexican beer companies; Grupo Modelo (producers of Corona, Modelo, Victoria, Montejo, etc.) or Cuauhtémoc Moctezuma (producers of Sol, Superior, Tecate Light, Indio, etc.) and to be equipped with furniture and decorations provided by that producer. It is rare to find a cantina offering products from both companies. Some feature full bars; some a limited liquor choice, and others offer only beer. Beer is available in ‘medias’ (i.e. normal individual bottles), and most cantinas also offer either ‘caguamas’ (1 liter bottles) or ‘megas’ (1.2 liter bottles) or sometimes both. The large bottles will automatically be accompanied with glasses; ‘medias’ normally are not, unless you request them. The majority provide complimentary botanas (snacks) – which vary widely in quality and quantity – until 6 – 7pm. Opening hours are normally from noon – 10pm; some close earlier if quiet; a few have extended licenses and remain open as late as 3am. 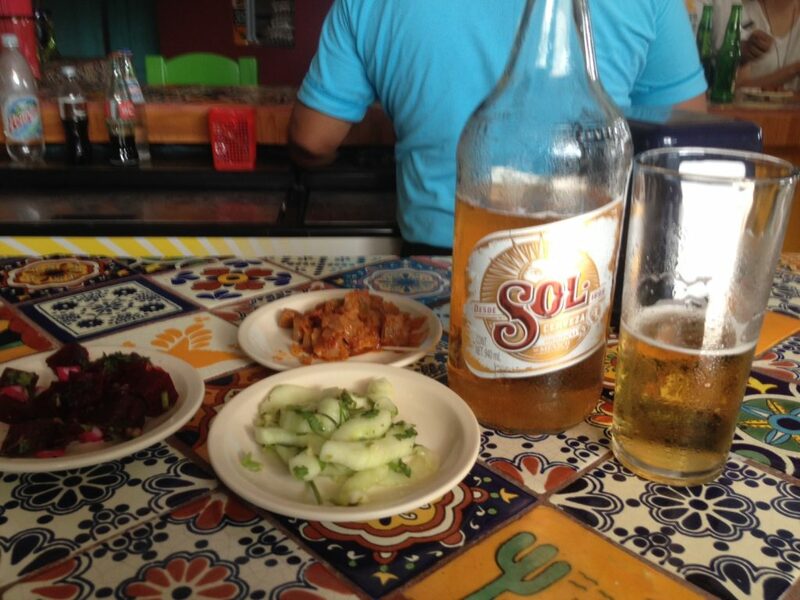 Generally speaking (although of course there are exceptions), cantinas on or south of Calle 61 tend to be rougher, dirtier, and less likely to be appealing to ladies and expats than those on or north of Calle 59. Those located near the markets and bus stations tend to be the roughest of all. Mérida being Mérida, (i.e. a very safe city), there are not really any ‘dangerous’ cantinas in town, however I wouldn’t recommend expat ladies (unless they are the adventurous type) to frequent cantinas around the markets or bus stations, as they are likely to feel uncomfortable and receive unwanted attention. 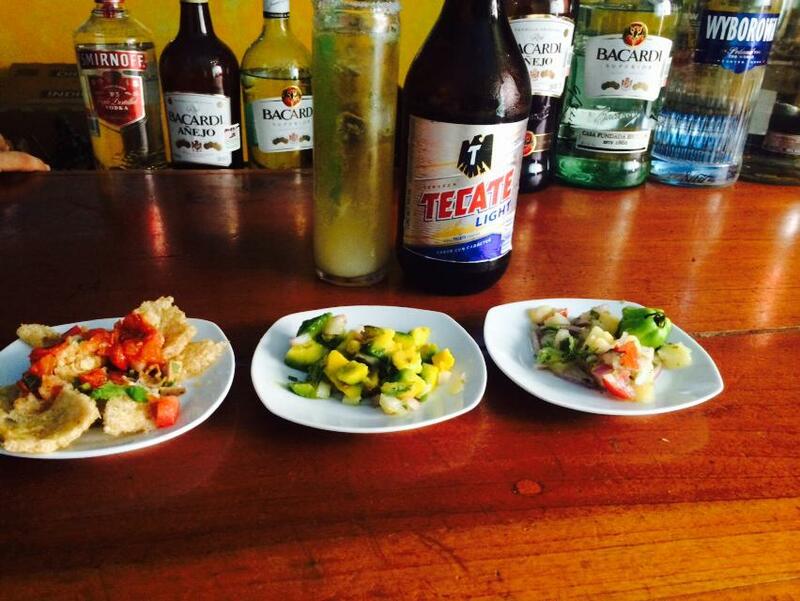 Cantinas from Calle 59 northwards tend to be better choices for ladies. The rougher the cantina, generally the more basic the furnishings; often bare walls, plastic tables and chairs, and toilet facilities which may not meet your expectations! So, who goes where? Time to name names. Again, what follows is based on my own personal research visits and opinions (with which you may not agree) and things may change at any time. Establishments are listed in no particular order. Calle 23 x Avenida Alemán, Col. Jesús Carranza. A historic cantina, dating from 1921, El Pocito offers a large ‘family’ seating area, and a posted menu of botanas, increasing in complexity with each round of drinks. Everyone will feel comfortable here. Calle 62 x 49, Centro. A historic cantina, recently remodeled and re-opened. Rather more bohemian atmosphere than most cantinas, and quite popular with the expat community. Everyone will feel comfortable here. Offers a ‘cantina-lite’ experience. Calle 66 x 47, Centro. Fairly small cantina. Everyone will feel comfortable here. Calle 53 x 52, Centro. Recently remodeled. Good botana selection. Everyone will feel comfortable here. Calle 59 x 52 y 54, Centro. Large cantina. Everyone will feel comfortable here. Calle 52 x 45 y 47, Centro. More of a neighborhood cantina, however everyone should feel comfortable here. Calle 45 x 60 y 62, Centro. Famed for its copious botanas. Go for lunch, and then go home for a siesta to sleep off the food! Everyone will feel comfortable here. Calle 55, x 44, Centro. 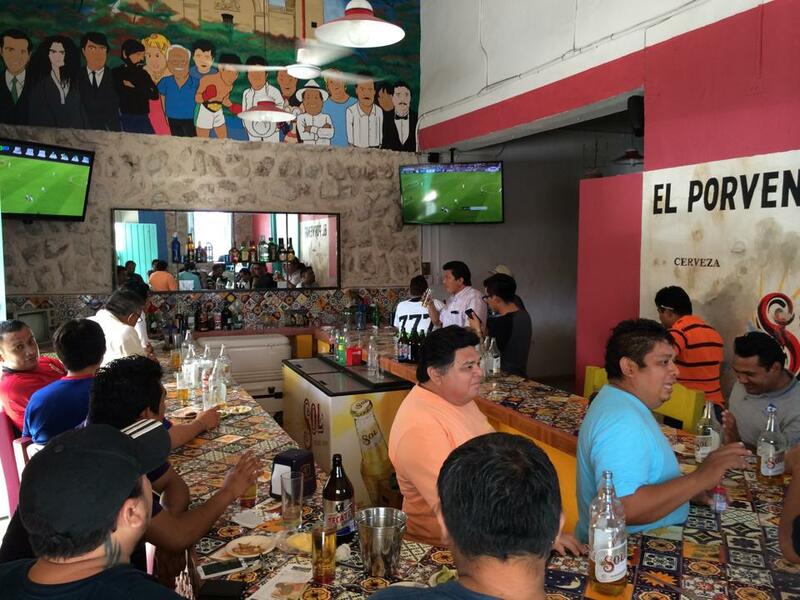 One of the most famous establishments in Mérida, known as the inventor of the ‘Chivo’ – a liter glass of chelada or michelada (beer with lemon and / or seasonings and a huge chunk of ice). It’s also one of the cheapest cantinas in town, and therefore attracts a younger ‘college’ crowd most days. Little or no botanas. A very diverse clientele frequents this cantina – everyone should feel comfortable here, but go with an open mind. Calle 56 x 63 y 65, Centro. One of the oldest cantinas in Mérida. Tends to be somewhat loud, and always packed. Attracts a diverse crowd. It’s been a very long time since any remodeling was done. Unless you are squeamish, you should feel comfortable here. Calle 65ª x 54 y 56, Centro. Located behind the ‘piñata’ street. A surprisingly clean and tidy cantina, given the location, with a stern looking lady manager keeping order. It’s rare to see foreigners here, however everyone should feel comfortable. Calle 65 x 62, Centro. Small historic cantina, founded in 1923, frequented by area workers. Ladies are never seen here, and probably would not feel comfortable for that reason. Calle 62 x 65 y 67, Centro. Large cantina with huge back patio. Calle 52 x 63 y 65, Centro. Somewhat rough bar, ladies tend to be ‘working’. Calle 54a x 65 y 67, Centro. Popular cantina near the market. Ladies are rarely seen here, and probably would not feel comfortable for that reason. Calle 67 x 60 y 62, Centro. Large and popular cantina, with small, nondescript entrance, easily overlooked. Popular with working men, builders, painters, etc. 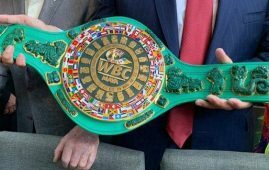 “Bellas edecanes”. Usually offers a good botana selection. Features lots of large flat screen TVs, showing football (soccer) matches. Female customers are rarely seen here. Calle 63 x 54 y 56, Centro. 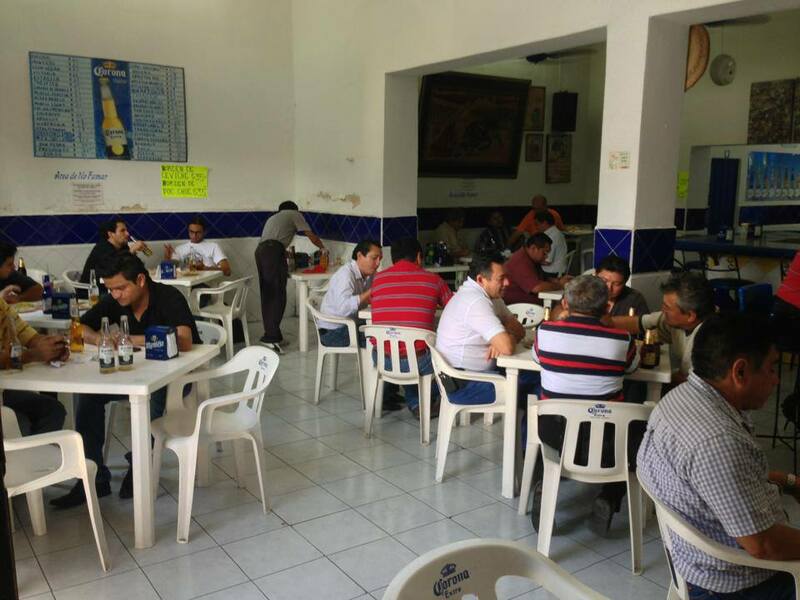 Bills itself as ‘A place for everyone’, and popular with Merida’s gay and lesbian communities. If you are open minded, you will feel comfortable here. 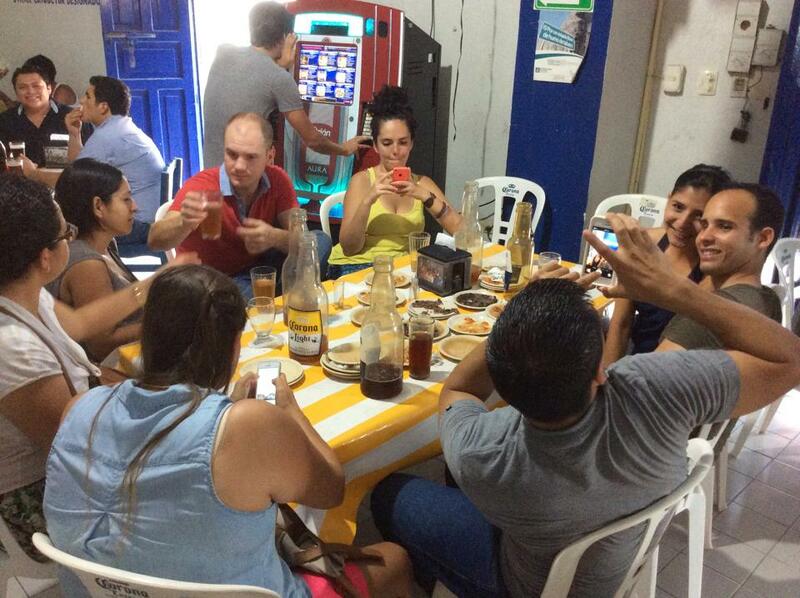 If you are interested in visiting a few cantinas in a group, and would enjoy making new friends, then an option could be the cantina tours offered by “Tour Cantinero MID” (https://www.facebook.com/pages/Tour-Cantinero-MID/609424329128906) which take place regularly. Visiting 4 or 5 ‘pre-screened’ cantinas generally on the north side of centro, the tours are free. Primarily patronized by locals and / or Mexican visitors, foreigners are very welcome, and can be seen on the tours from time to time. Check their Facebook page for details of upcoming tours, meeting place and time, etc. Have you been to any cantinas not mentioned here, which you would recommend? Or cantinas you’ve been to and would NOT recommend? Or thoughts on those listed above? Please add your comments below! We’d love to hear what you think. Born in Europe, raised in the Middle East, and a long-time resident in the Americas, Stewart has been based in Mérida, Yucatan since 2010, and has lived and worked worldwide in the media, travel, tourism and transportation industries for well over 20 years. His local contacts and global knowledge provide him with unmatched access to the stories ‘behind the stories’ and he likes to take you to the places that others don’t or won’t go. From the Arctic Circle to Tierra del Fuego, from Moscow to Melbourne, from Bergen to Buenos Aires, Stewart has been there. Chances are, wherever you are heading, he knows the score. In addition to The Yucatan Times, Stewart contributes (or has contributed) to “The Examiner” (www.examiner.com), “Business Briefings”, “Cruise & Ferry Magazine” and “The Apollo Magazine”. He is a former editor of “rolling pin CRUISE” magazine.